This is an easy low carb Christmas dinner that you can easy make for your family this holiday season. 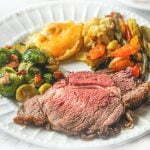 Prepare the side dishes the night before and all you need to do is make the roast which I have tips to show you. For roasted vegetables see footnote. The night before, mix spices and rub all over roast. Wrap in plastic wrap and refrigerate over night. The next day take roast out 1/2 hour before roasting to come to room temperature. Preheat oven to 450 degrees F. Place on a rack and then place that on a cookie sheet or roaster pan. Roast for 15 minutes then turn down to 325 degrees for 2 hours and 1 minute. Please use the Roast Perfect app to get exact times for different size roasts and for the degree of doneness. This recipe is for a 5.5 lb rib roast done to a medium - medium rare. When internal temperature reaches 135 degrees F, take out of the oven, tent with aluminum foil and rest for 15 minutes before carving. To make the twice baked cauliflower mash. The day before, chop the cauliflower and place in a microwaveable bowl. Cook for 15 minutes. Place the cooked cauliflower in a high speed blender along with the cream cheese and French onion dip. Blend on high to puree. Spoon cauliflower mash into a baking dish and sprinkle cheddar cheese on top. Cover and refrigerate until ready to eat. To cook, place in the microwave for 5-7 minutes until heated through and cheddar cheese is melted. To make the Brussels sprouts and bacon. The night before cut the sprouts in half and microwave for 4 minutes. Refrigerate over night. 10 minutes before eating, cook the bacon in a large saute pan. Take out the bacon and saute the sprouts in the bacon grease for a few minutes. Sprinkle crumbled bacon on top before serving. To make the roasted vegetables. Note you can use regular olive oil in this recipe.